Positive PMI Composite and IFO reports in EU and Germany left a positive impact on EUR. The support rests at 1.08770 with resistance at 1.09190 which both lines are below the weekly pivot point at 1.09260. The EMA of 10 is moving with bullish bias and it is located below the EMA of 100 and the EMA of 100 is located below the EMA of 200 which shows the long term bearish trend of this pair. The RSI is moving horizontally on the 50 level, the Stochastic is showing downward momentum and the MACD indicator is in negative territory, heading up. The ADX is not showing any clear signal at the moment. 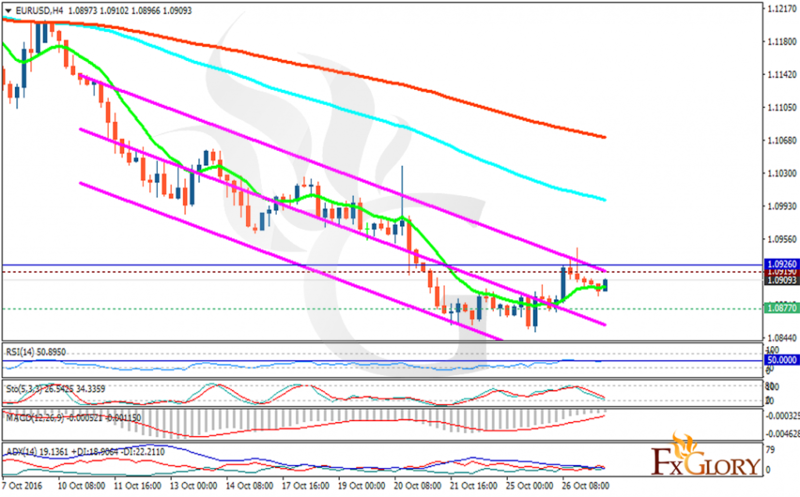 Taking the bearish scenario, EURUSD is targeting 1.0850.